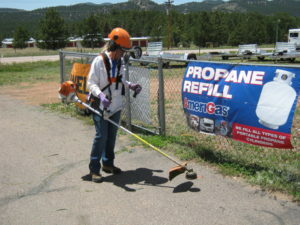 Stihl Weed Wacker – This Stihl string trimmer is a high performance, fuel efficient, yet powerful trimmer. The straight-shaft grass trimmer is light and handles effortlessly. It has a simple, reliable and convenient starting procedure with a momentary stop switch that automatically returns to the start position. This trimmer is always at the ready to go to work, and has an adjustable front handle and shoulder strap to make trim work more comfortable.